Valentino Rossi has achieved umpteen feats in his career but a unique feat was added to his list last season in MotoGP. In the previous season, when Rossi completed the 15th lap at Jerez in Spain, he achieved a feat of taking a lap around the world. He achieved the unique milestone of racing the distance equivalent to the lap of the world, 40,075 KM. It was Rossi's 396th GrandPrix, and he finished 5th in the race. This feat is special as it only counts the laps that Rossi have covered in races over 23 years, leaving out the distance that he has slogged in practice and qualifying sessions. Valentino Rossi took 23 seasons to trace the circumference of the world on different MotoGP circuits across the world. In 23 seasons, Rossi managed to take wins in 115 races and podiums in 232 races. Rossi has won nine world championships across different categories (MotoGP, 250cc and 125cc). Out of 9 world championships, Rossi has won seven in premier class MotoGP and one championship each in 125cc (MOTO 3), and 250cc (MOTO 2). Valentino Rossi started his racing career in 1996. As he was a promising young rider in his formative years, Rossi rose through the ranks gradually, graduating to high levels of motorcycling subsequently. He won 125cc and 250cc titles in the years 1997 and 1999 respectively, before graduating to the premier class in 2000. Rossi had a stellar debut season. He announced his arrival at the helm by finishing 2nd best after the season winner Kenny Roberts Jr.
Rossi was unstoppable in the years to come. He won consecutive championships for straight five years from season 2001-2005, raising the standards of motorcycle racing. He appeared an invincible opponent for then-champion riders Max Biaggi and Sete Gibernau. After a disruption in performance in the 2006 and 2007 seasons, he came back strongly and won 2008 and 2009 seasons. Apart from the debut season in 2000, he finished 2nd in the championship in years 2006, 2014, 2015 and 2016. He finished 3rd best in 2007, 2010 and 2018 MotoGP seasons. 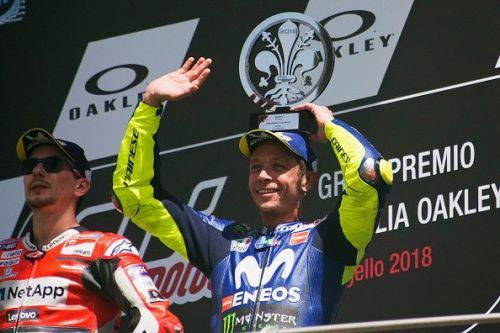 Valentino Rossi is first in all-time win standings in 500cc/MotoGP class and stands second in overall standings with 115 wins. He is 7 wins behind Giacomo Agostini, who leads the list with 122 wins. Rossi has led an inspirational motorcycle racing career. Despite being in the dawn of his career, Rossi is still very competitive at the age of 40. It is difficult to rule him out of the contest and he would surely be one of the prime contenders for this year's title. He has already inked the contract with Yamaha till 2020, and with season 2019 soon to be underway, we can expect to see a lot more from Rossi.